Just because cold weather is on the way doesn’t mean your Reno landscaping or garden has to call it quits. 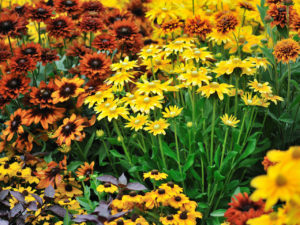 There are a number of pretty perennials out there that perform well as fall comes to a close. Whether it’s a plant with an on-and-off bloom cycle that powers through cooler autumn temps, or blooms that extend late into the year, we’ve rounded up our top picks below for ensuring your Reno landscaping and garden stays bright and blossoming—sans summer sunshine. Plants are classified as annual, biennial or perennial. Annual plants last for one growing seasons, producing seeds and then dying. Biennial plants last for two growing seasons. Perennials are plants that live for more than two years. What plant zone is Reno? Thanks to the USDA’s Plant Hardiness Zone Map, gardeners across the country have a guide for which plants are most likely to thrive at different locations. For Reno landscaping purposes, we are in Zone 6. What perennials should I add to my Reno landscaping for a garden that lasts through fall? Below, we’ve broken down perennials that power through fall with late blooms, perennials that peak from late summer into fall, and plants that bloom on-and-off with a seasonal cycle that extends into colder autumn months. At Reno Green Landscaping, we have over four decades of experience custom-crafting innovative landscaping solutions for Reno residents that take into account the cool autumn months. Reach out to our seasoned team of landscaping pros today to schedule a consultation for exceptional, fall-friendly, custom landscape designs.